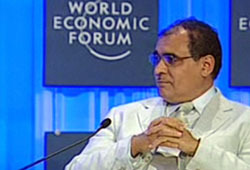 Professor Ahmed Elmagarmid was one of 20 academicians invited to attend the May 15-17 2009 World Economic Forum on the Middle-East (WEF) held in the Dead Sea, Jordan to discuss the current economic crisis and its implications on the region. This invitation was a first time experiment of the WEF to add a hand full of scientists to politicians and policy makers, CEOs, economists, and world leaders who normally attend the forum. It was the hope that expert scientific knowledge would help contribute towards resolving the world economic crisis. 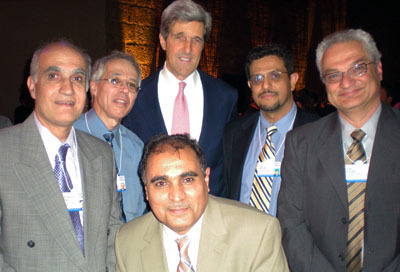 While at the Forum, Elmagarmid participated in a plenary panel and breakout groups with world renowned leaders. Elmagarmid specifically served as a panelist on a star studded panel on identifying the technology leap, and served as one of the facilitators on an IT session held as part of the forum. One of his breakout groups included presidents of Estonia, Congressman Brian Baird, and many other world leaders. Elmagarmid says, "It is evident that innovation in science and technology is key to getting us out of this economic crisis and that it is not possible to get out of this crisis using cost cutting and resource redirection alone. It is more evident than ever that incremental improvements will not work. The whole world has to be more bold and take more risk in pursuing technological innovations towards economic recovery." The King and Queen of Jordan, European and Middle eastern region leaders from government, industry and non-government organizations were at hand for the three day forum. Elmagarmid is a professor of computer science at Purdue University and the director of the Indiana Center for Database Systems and the Cyber Center in Discovery Park. He focuses on a large spectrum of foundational and application-oriented database research. He has been involved over the last several years in research and higher education policy issues. He has been an adviser to the Qatar Foundation and a consultant to the Sidra Medical Research Center.